There's been some confusion as to whether or not Kurt Russell had officially joined the cast of Fast & Furious 7. An unofficial Twitter feed seemed to indicated that the actor hadn't finalized a deal to star, and since they were right about more Fast & Furious sequels in development, not to mention Tokyo Drift star Lucas Black returning to the franchise, we thought they might be right. 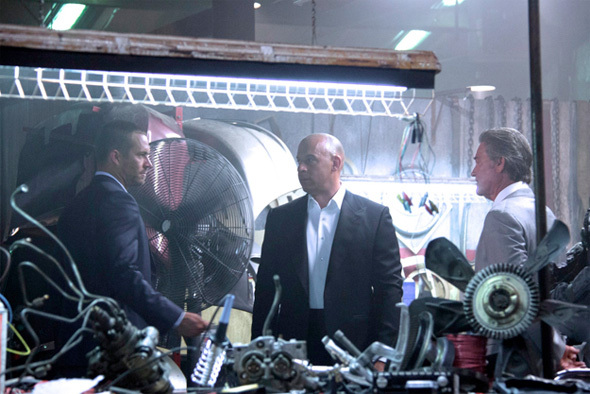 But thankfully, Vin Diesel has confirmed the actor on set with a first look photo featuring himself along with Paul Walker and Russell in a car garage somewhere, possibly following the funeral for their fallen friend at the end of Fast & Furious 6. Remember that the unofficial Twitter feed indicated that "Kurt Russell was almost about to join #Fast7. He would play the father of Jesse, and he would be Toretto’s villain." Fans of the franchise might remember Jesse from way back in the first film. Portrayed by Chad Lindberg, the character was an ADD-rattled street racer and computer nerd responsible for a lot of vehicle designs, background checks on racers, and hacking the engine's of Dom's vehicles. However, in the first film, he ends up getting shot and killed in a drive-by on Dom's house. If that's true, this could be a very personal sequel. Bring it on! I'm excited about this series. It seems like studios and the powers that be might be starting to make more of a conscious effort when it comes to prolonging quality of franchises. Instead of using the franchise as a crutch, or one big star as a crutch, and then just sort of phoning in the rest of the process, so-so director, so-so screenwriter, so-so cast...and getting diminishing returns because of it....it seems that Universal has recognized the power of keeping the talent on board, and making the kind of moves that might actually ELEVATE the quality of the films. I mean, it is no secret, Fast Five and Furious 6 are the best in the whole franchise, in my opinion even better than the first film. Universal wasn't scared to bring the original cast back, to keep Justin Lin spearheading the series, and to progress it. Now it seems like they are doing the same thing, James Wan, typical action director or not, is a very talented director. They have the writers/producers/cast carrying over from the previous films, and they are continuing to up their game by bringing in big names like Jason Statham, Kurt Russell, and Tony Jaa. I don't think that Twitter was the first to break the news of Lucas Black or the additional installments. Vin has been saying since the Fast 6 press tour that 7 starts a new trilogy. And having Lucas Black come back on is something that fans have been wanting since they saw the cliffhanger. So it makes sense that a fanmade Twitter account would tout Lucas Black returning. YES? NO? Have you decided yet?! I rechecked that Twitter account. It officially says "Unofficial (Fanmade)". So it's best to stop putting stock into that Twitter account. I'm sorry, but I miss the early days. The 2001 original, Tokyo Drift... I just don't feel these later sequels. You mean because the movies now are good?